ABU DHABI, UNITED ARAB EMIRATES, 26 May 2009—His Highness General Sheikh Mohammed bin Zayed Al Nahyan, Crown Prince of Abu Dhabi and Deputy Supreme Commander of the UAE Armed Forces, today welcomed French President Nicolas Sarkozy to a commemorative ceremony to mark the start of construction on the Louvre Abu Dhabi — the first universal museum to be built in the Middle East. In a presentation before dignitaries at Emirates Palace, H.H. Sheikh Mohammed and President Sarkozy accepted a time capsule for the museum from children from United Arab Emirates and France which will be placed in the Louvre Abu Dhabi at a future date. His Highness Sheikh Mohammed and President Sarkozy also inaugurated a new preview experience of the Louvre Abu Dhabi, being presented through 2 July in Gallery One of Emirates Palace. Titled Talking Art: Louvre Abu Dhabi, the preview features a brief film about the design for the Louvre Abu Dhabi by Pritzker Prize-winning architect Jean Nouvel; an illustrated talk; and a guided tour of selected artworks specially chosen to demonstrate the curatorial vision of the Louvre Abu Dhabi. 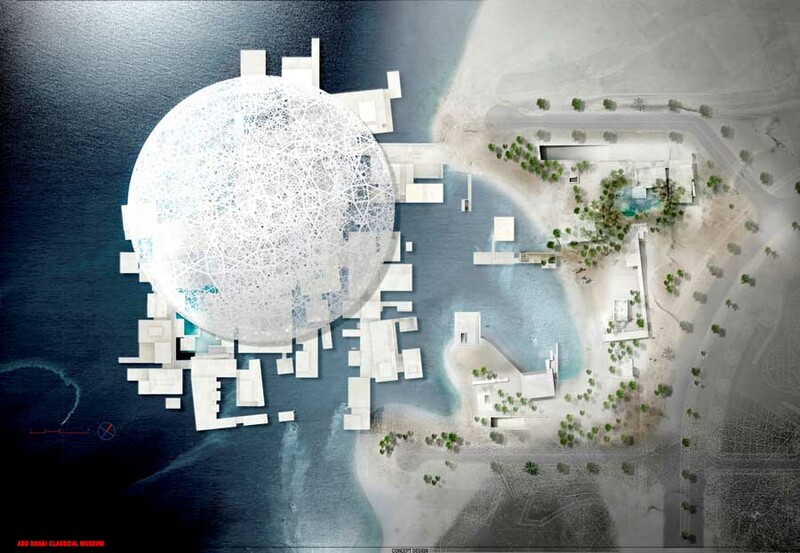 Scheduled for completion in 2012/13, the Louvre Abu Dhabi will showcase the interrelationships among artistic achievements from different cultures around the world, from the most immemorial to the very latest, across borders of technique and geography. With works loaned by the Louvre and other French museums, such as Musée d’Orsay, Centre Pompidou, Musée Guimet and Musée du Quai Branly, and works of art from its own developing collection, the Louvre Abu Dhabi will establish a distinctive dialogue among fine arts, decorative arts, and archaeological artefacts that have been created and collected all over the world, in a presentation that is unique to this museum and its setting. 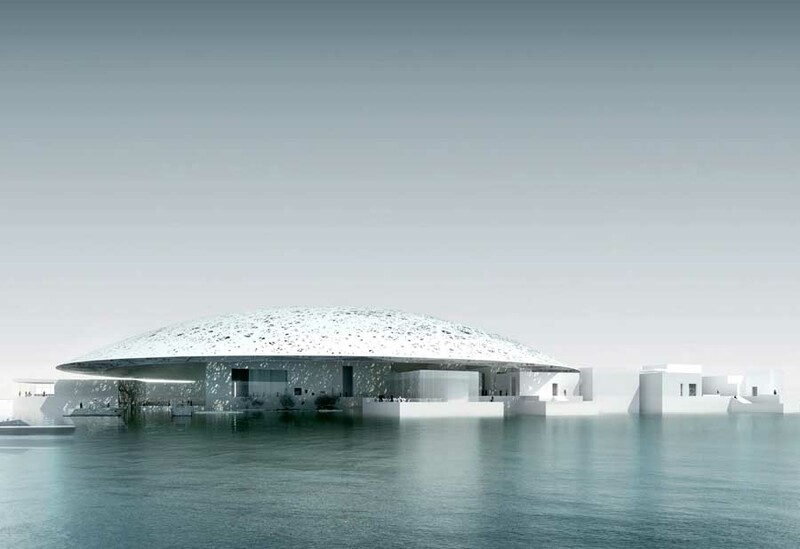 Built on Saadiyat Island in Abu Dhabi, the 24,000 square metre (260,000 square foot) Louvre Abu Dhabi is conceived by architect Jean Nouvel as a complex of pavilions, plazas, alleyways and canals, evoking the image of a city floating on the sea. Hovering over the complex will be a form inspired by traditional Arabic architecture: a vast, shallow dome—some 180 metres (590 feet) in diameter—perforated with interlaced patterns so that a magical, diffused light will filter through. The preview experience in Gallery One of Emirates Palace, Talking Art: Louvre Abu Dhabi, offers examples of the interrelationships among cultures and epochs that will be central to the new institution. The preview has been organized jointly by Tourism Development & Investment Company and Agence France-Muséums. Two sessions of the preview are offered to the public each day, at 11:00 am and 6:30 pm, with pre-registration required. An exhibition presenting a thorough overview of the Louvre Abu Dhabi will be organised at a later date. In conjunction with the inauguration of Talking Art: Louvre Abu Dhabi, a highly distinguished group of scholars and cultural leaders from France will open a two-day series of public panel discussions on the evening of 26 May, to address ideas that are central to the new institution. The discussions focus on “Museums and Universalism” and “The Louvre Abu Dhabi: A New Way of Showing Art.” A third session of these public discussions, held at 3:00 pm on 27 May, will be devoted to training schoolteachers, to assist them in making Talking Art: Louvre Abu Dhabi more meaningful to young people ages 11 and higher. As the very first universal museum in the region, the Louvre Abu Dhabi will inaugurate on Arab soil a cultural institution born in Enlightenment Europe. Within the 6,000 square metres (65,000 square feet) dedicated to its core exhibition, the museum will present a multidisciplinary, thematic installation of important archaeological artefacts and major works of fine arts and decorative arts from all historic periods and cultures. By placing these works in context, the installation will create a dialogue of civilisations among three major poles: European, Asian and Islamic/Middle Eastern. The Musée du Louvre and other French museums will lend works to the installation, with works of art being rotated on an individual schedule (from six months to two years) so that returning visitors will always have a fresh experience. The number of works lent to the core installation will gradually diminish as the Louvre Abu Dhabi builds up its own collection, with loans scheduled to stop after ten years. 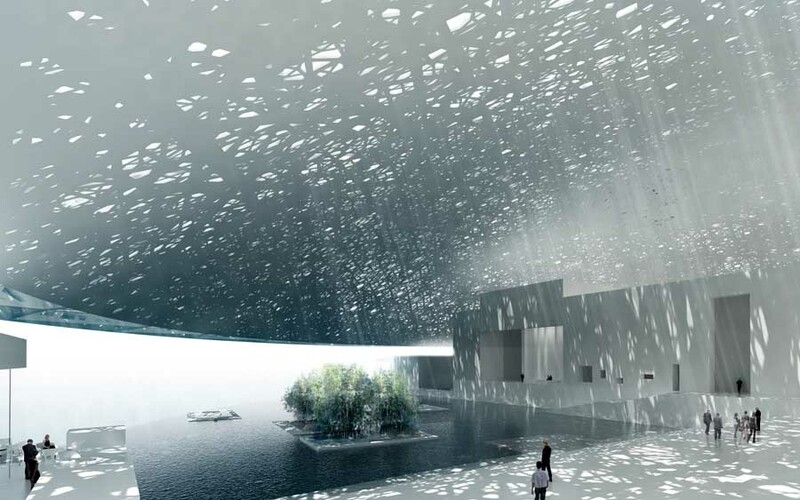 The Louvre Abu Dhabi will also feature 2,000 square metres (22,000 square feet) of space for temporary exhibitions of international importance, which French partner institutions will organise on an annual basis. 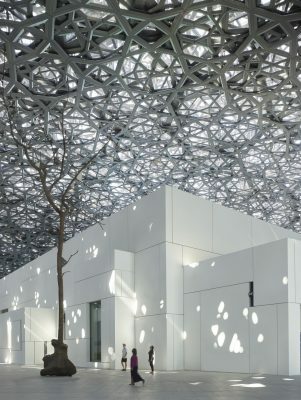 The Louvre Abu Dhabi has been made possible by a cooperative cultural intergovernmental agreement between the United Arab Emirates and France, signed on 6 March, 2007 in Abu Dhabi. The new museum will bear the name of the Louvre, the largest museum in the world, for a period of thirty years. 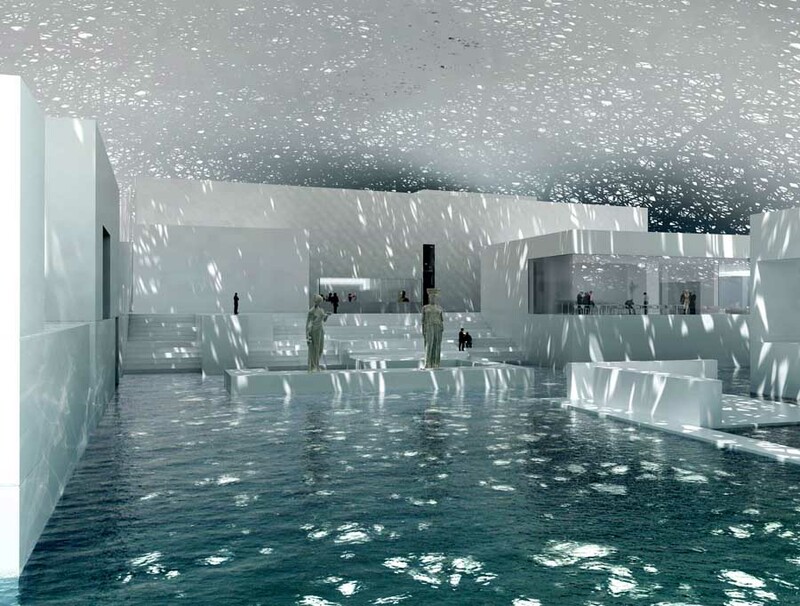 The Louvre Abu Dhabi will be a unique museum linking the culture of Abu Dhabi and the excellence of French museums. The continuing cultural partnership between France and Abu Dhabi has already laid an intellectual and institutional groundwork for the Louvre Abu Dhabi. At the Musée du Louvre, Abu Dhabi is supporting the creation of a suite of galleries named the Sheikh Zayed Pavilion, housing permanent displays of artworks from around the world. The Emirate is also supporting the creation of a major new French centre for art research, conservation and storage. At the French royal palace at Fontainebleau, Abu Dhabi is sponsoring the restoration of the historic theatre, which is now named the Sheikh Khalifa Theatre. And within Abu Dhabi itself, the developer of the Saadiyat Island Cultural District—Tourism Development & Investment Company—has collaborated in 2008 with the Musée National Picasso in Paris to present Picasso Abu Dhabi, the first major retrospective in the Middle East of the work of the 20th century master. Saadiyat Island is the largest single mixed-use development in the Arabian Gulf. The island, which has 18 miles (30 kilometres) of water frontage and boasts many natural assets, including mangrove forests, is being developed as a strategic international leisure, cultural and tourism destination and marks a new era in the rapid evolution of Abu Dhabi, the largest of the seven emirates which form the UAE Federation. Saadiyat Island will be developed in three phases with total completion scheduled for 2018. The master plan envisages seven distinct districts – Cultural District, Saadiyat Marina, Saadiyat Beach, South Beach, Saadiyat Park, The Wetlands and Eco-point. There are plans for luxury hotels, more than 32 million square feet (3 million square metres) of office space, marinas with combined berths for around 1,000 boats, two golf courses – one of which is the UAE’s first Gary Player Signature course and the Arabian Gulf’s first “ocean” course – civic and leisure facilities, seaview apartments and elite villas. Saadiyat Island is expected to be home to a community of more than 150,000 people – approximately the same population as Chang Mai in Thailand, Oxford in the UK, Dijon in France or Hartford in the USA. Saadiyat Island will be linked to Abu Dhabi via a Saadiyat Link road which will connect the Shahama district to Saadiyat Island, and connect to the 10-lane Saadiyat Bridge which is already under construction from Abu Dhabi’s Mina Zayed area. In addition to the Louvre Abu Dhabi, other institutions now in progress in the Saadiyat Island Cultural District are the Zayed National Museum designed by Foster + Partners and the Guggenheim Abu Dhabi Museum designed by Frank Gehry, both of which are also scheduled to open in 2012/13. Two other institutions—the maritime museum, designed by Tadao Ando, and the performing arts centre, designed by Zaha Hadid—will begin development in 2013 as the second phase in the Cultural District project. Saadiyat Island is being developed by the Tourism Development & Investment Company (TDIC), an independent public joint stock company. Under the leadership of its Chairman, His Excellency Sheikh Sultan Bin Tahnoon Al Nahyan, TDIC is charged with developing real estate assets that support UAE economic diversification. In addition to developing the Cultural District, TDIC’s strategy for Saadiyat Island is to secure the participation of private investors who will each develop their sites in accordance with the master plan and supporting planning regulations and design guidelines. TDIC operates along strictly commercial lines with its projects being self-sustaining and economically feasible. Its activities include creating concepts for specific sites and locations; disposing of, or repositioning, government-owned assets; entering into joint ventures with investment partners; and serving as the master developer for large-scale projects. Agence France-Muséums was set up on 11 July 2007 in Paris, in accordance with the intergovernmental agreement signed between France and the United Arab Emirates on 6 March 2007. 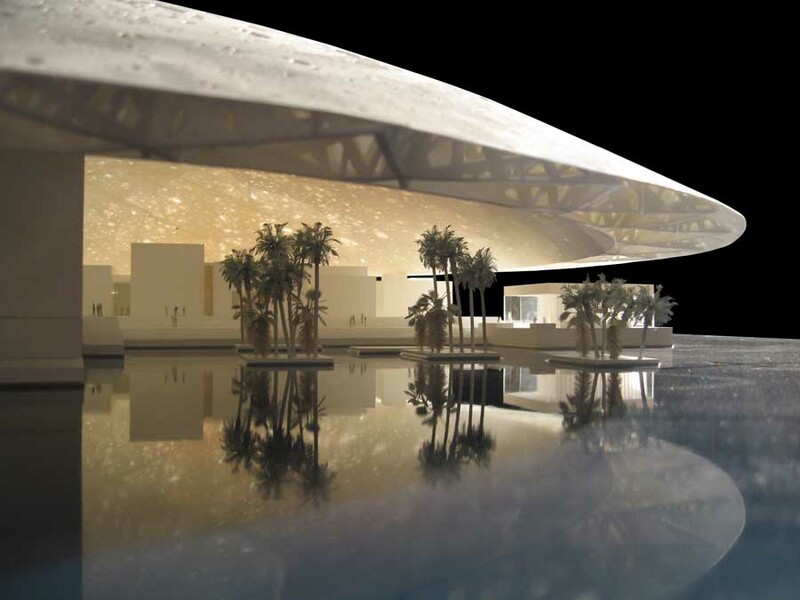 Agence France- Muséums has been entrusted with the task of carrying through the commitments of France to the project of the universal museum of the Louvre Abu Dhabi and structuring the expertise of the French cultural institutions involved. The capital of Agence France-Muséums, a simplified joint stock company, is held by twelve public cultural establishments: the musée du Louvre, the Centre Pompidou, the musée d’Orsay, the Bibliothèque nationale de France, the musée du quai Branly, the Réunion des musées nationaux, the musée et domaine national de Versailles, the musée Guimet, the musée Rodin, the Ecole du Louvre, the domaine national de Chambord, and the Etablissement public de maîtrise d’ouvrage des travaux culturels.